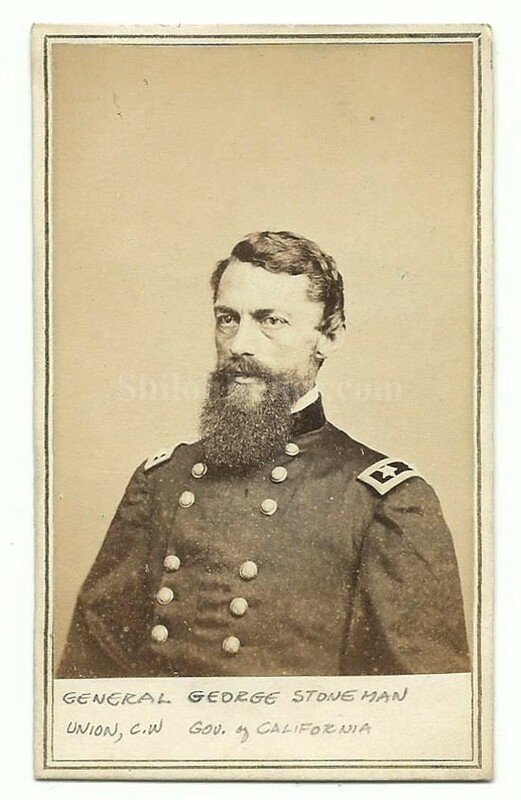 This is a great looking original Civil War era CDV image of Union General George Stoneman. George Stoneman was born in New York on August 22, 1822. He graduated West Point military Academy in 1846. At the outbreak of the war he served with his West Point classmate George McClellan and was made chief of cavalry of the Army of the Potomac. He made the rank of Brigadier General on August 13, 1861. On March 16, 1863 he was promoted to the rank of Major General, which is the rank he held in this image. He is best known for his operations that are known as "Stoneman's raid" which caused havoc to Confederate General Robert E Lee. During the famous Atlanta campaign. He was in charge of the cavalry for of the Army of the Ohio. He was captured on a raid to free the prisoners at the Confederate prison camp in Andersonville, Georgia. He was exchanged in October 1964. After the Civil War he was elected governor of the state of California in 1882. The face of the card is an image of the General in his Major General uniform. These were often sold in quantity to people on the home front that wanted to see what the men they read about in the papers looked like. These CDV images were an important part of history from the Civil War era. It was the first practical way to bring images of a famous personality home to the regular people. The people wanted to be able to put a face with the names they read about in the newspapers. You could order through newspaper ads or at local photography studios, several images of famous personalities for a reasonable amount. The CDV images were made by applying a thin paper photo image of the famous person of the day to a heavier paper card. This made the image more durable and easier to display and also added uniformity to the size. The overall size of a CDV image is approximately 2.5 inches by 4 inches in size. 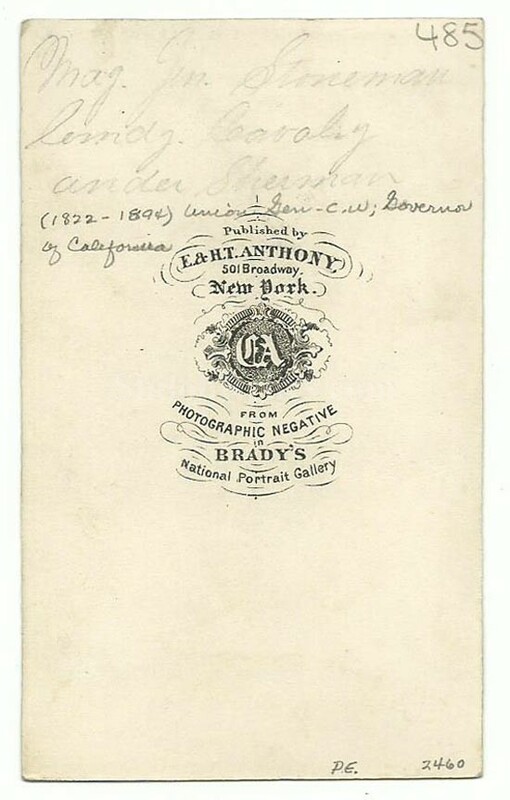 On the back of the card it has the desirable backmark of the Anthony firm of New York and notes that it was taken from one of Matthew Brady's negatives. This is a nice touch on an already wonderful image. This is a great looking image of one of the most popular Union Generals in American history.